In its continuing quest for world dominance, at least as regards headphones, Sennheiser still has the odd gap in its range, which it proceeds to fill bit by bit. Another piece fell into place with the recent announcement of the HD380, a folding, closed-back model aimed at professionals but equally applicable, as far as we can see, to the travelling audiophile. The basic idea is evidently that professionals – recording engineers and so on – need something that they can easily carry around and rely on for critical monitoring. This could be in noisy circumstances (such as in the same room as the music one is recording), which makes it particularly hard to hear what's coming from the microphones. But does the same criteria apply if one wants to enjoy music in private, perhaps in noisy surroundings. In-ear monitors can offer better exclusion of outside sound but plenty of listeners can't get on with them at all and noise-cancelling phones have their own problems. The HD380 should be just the thing for such folks. It's a near-full-size over-the-ear headphone which folds up either flat (for which a neat zipped case is supplied) or sort-of coiled, in which case it will fit into a large pocket. It comes with a full length curly cable and is well padded on both earpieces and headband, making for a comfortable fit despite the quite strong spring. 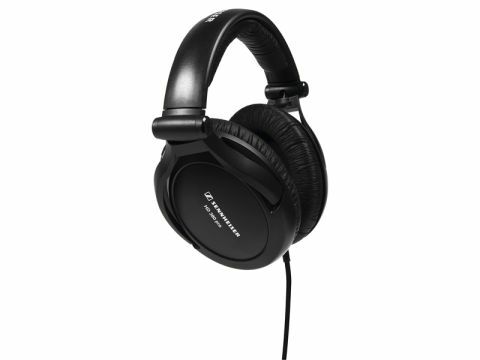 Sennheiser makes no particularly unusual claims for this model as regards specification: it has a fairly low impedance of 54 ohms which makes it compatible with portable devices, and uses neodymium iron magnets which also help boost sensitivity. Isolation from outside sound is quoted as 'up to 32dB', which may be optimistic as a broadband figure, but there is a very clear reduction of outside sound-level and also gratifyingly little leakage from the cans to the outside. Closed-back headphones practically never, in our experience, quite match open types for naturalness of timbre and there is indeed some coloration inherent in this model. However, as its breed goes it is very good in that regard. Principally, there is a little boosting of the upper midrange but it isn't offensive and one soon gets used to it. We would certainly counsel any prospective buyer to listen for longer than initial impressions, though, as this coloration can sound like effects in lesser transducers due more to distortion than to frequency response aberrations as such. The difference is not semantic. You get used to a slightly wavy response quickly, but distortion just gets more annoying the longer one listens. On the contrary, in this case the sound is very clean and free of distortion and the result is that one can hear a great deal of detail in recordings of all kinds. As with a few other closed headphones we've tried there seems to be an optimum loudness for detail – too quiet and one can't hear, too loud and things get a little hard-sounding – and that optimum is gauged about right at a realistic level compared with live music. Bass is excellent, another typical closed headphone result, with fantastic weight and at the same time no sense of vagueness or lack of control. High treble is clear and apart from the coloration mentioned above most of the midrange is pretty natural. On balance, we'd say the sound is better with musical styles like rock, upbeat jazz and lively pop than with classical, which shows up the frequency response irregularities rather more, but this is a revealing and enjoyable transducer with pretty much any music.